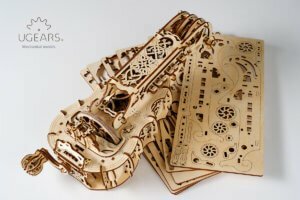 UGEARS Hurdy-Gurdy: unique mechanical musical model. Engineered for self-assembly and play. Just build with your own hands and feel yourself like Stradivari and a popular Hurdy-Gurdy star. The history of this instrument started in the 15th century. One of the earliest forms of the hurdy-gurdy was the organistrum (a portable organ) in Medieval Europe. After some modifications it became a common instrument among travelling musicians in England and went through its renaissance period in the later 17th-18th centuries as more of the noble class musical instrument for parties. Those instruments were decorated by craftsmen with inlays and carving and had the built-in hurdy-gurdy mechanism into the guitar or lute body. There is a cool interpretation of Hurdy-Gurdy: a medieval rock’n’roll. It captured us and we decided to create Ugears’ version of Hurdy-Gurdy. Inspired by the art of medieval masters, enriched by smart engineering of XXI century and created by Ugears engineers’ collective imagination. Richly detailed with an eye toward romance and artistry, our version of this indelible symbol of medieval life and adventure impress of all who see and play it. The Ugears Hurdy-Gurdy is the fully fledged musical instrument. It’s easy to play: just turn a crank with one hand putting the rhythm into the music and push the keys with the other. Unique combination of good taste, wood and mechanics. Awesome gift and smart hobby idea for your beloved. The model is equipped with everything needed for assembly. The quality of the parts is very high – a laser method with precision 0.01mm is used for cutting items from a plywood board. The details are already cut out and can be easily removed from the board. All steps of the assembly are described in very detailed step-by-step color instructions. 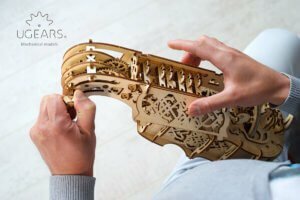 The Ugears Hurdy-Gurdy assembles easily and without the need for glue, toothpicks or special tools thanks to our patented plywood joints. The assembly of the Hurdy-Gurdy includes the several stages. Firstly, you put the smaller parts together to form the large blocks: the body, decks, wheel, crank, head, tuning pegs, keyboard, melody strings – which will altogether complete the whole model. Just build it together with your own hands and feel yourself like Stradivari and popular Hurdy-Gurdy star! 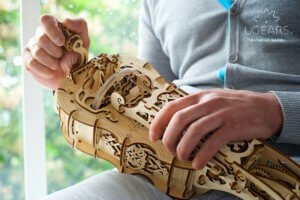 Ugears Hurdy-Gurdy has a unique design and a lot of technical elements and details that turns the assembly and playing process into exciting game and brings you hours of pleasure and fun. The Ugears Hurdy-Gurdy’s tuning pegs have gear reduction mechanism for finer sound tuning of the melody and bourdon strings. For more clear sound you can switch off the bourdon string with the help of a little lever arm in the keybox. Also we added the gear reduction mechanism into the crank (handle) to increase the number of wheel’s revolutions. That’s allowed us to get more smooth and rich sound and preserve a compact size of the model itself. All 6 keys are spring-loaded with the help of rubber bands and little cranks in the keybox for a quieter and more convenient play. 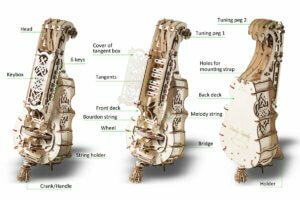 Also Ugears Hurdy-Gurdy has a special mechanism to adjust the height of both strings (melody and bourdon string) on the bridge and beautiful planetary gears mechanism inside the body. The model has a melody string for playing melodies and a bourdon string for steady sound. 6 keys to play 6 notes turning the big crank (handle) with one hand and pressing the melody string with relevant keys with the other. To play the seventh note – just turn the crank with wheel without pushing any keys. You can tune the second string (bourdon string) with the help of the respective tuning peg in unison to the melody string or in any melodic interval (quart, quint, octave). The construction kit includes some pieces of rosin to wax the wheel. It also improves the sound. 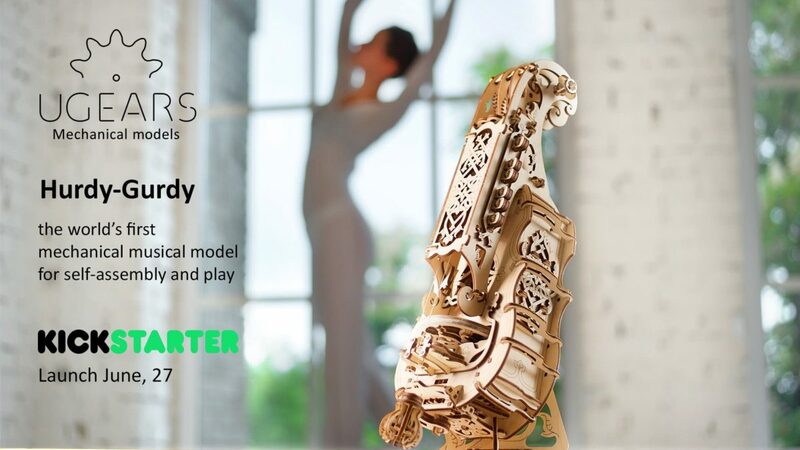 Ugears Hurdy-Gurdy is a mechanical musical instrument. To play it – just turn a crank with one hand and push the keys with the other. You’ll find the tablature of the tunes from the Hurdy-Gurdy Campaign in the assembly instructions for the model. This will help you to get the rhythm of playing and to create the ones for the melodies you love. 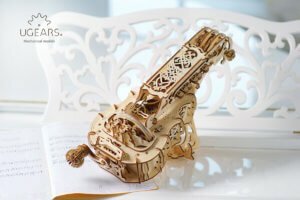 Ugears Hurdy-Gurdy brings the unforgettable time of working together on things that are popular among people of any age. Just put it together and have a dancing party with your beloved or friends playing solo, a duet, trio quartet the melodies you love (folk, modern, etc).